Oh, why, won't blogger let me post more than 4 pics at a time from Picasa??? Anyway, here are shots of Gavriel Zev's costume-in-progress. He's being a sock monkey. Actually not quite before as I had already cut the socks up before I realized I might want a picture. 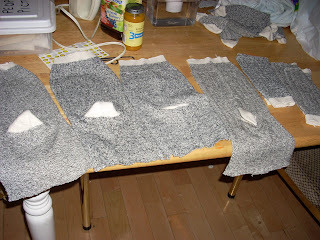 I have used 9 socks so far. They are all from Dollarama, $1 per pair, so if I use 10 socks, that'll be $5 for a costume!!! Sewing is kind of the opposite of food photography... everything looks so masterful and accomplished even if up-close it looks kind of horrible. I am hoping people will see only the cuteness of my baby and not so much the flaws in his sock-monkey suit. 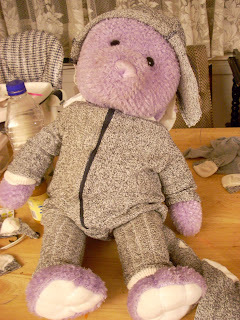 Thanks to Big Purple Bunny as usual for his modelling prowess. NOTE: I haven't decided what to do for the head yet. 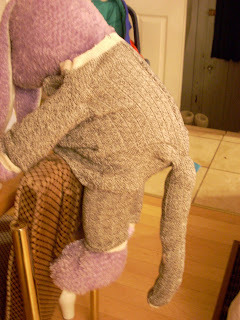 There is a head-thing that I am deliberately leaving unformed while I decide - I originally wanted it to be a hood with monkey ears, and that's still my first choice. Right now, it's just a hat which is open on one side. For these pictures, I have turned it around so the opening is at the back and not visible. 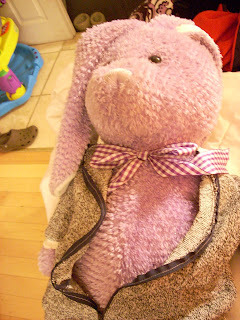 Yes, this does look slightly risqué: "zipper open, Big Purple Bunny reveals his wilder side... or at least the purple check ribbon which was previously concealed by the zipper." Once again, proud of myself. Not everybody can turn 9 socks into something that passes for a baby costume. And I personally have come a long way from my Glue-Gun Years, when even a straight seam would be "sewn" with glue. Ick. I mean it works, but it's terribly STIFF. I wish I could redo Yerachmiel and Elisheva's baby-dino costumes but properly applique the spots instead of gluing them on. On the other hand, I doubt anyone seeing the costumes would have known the difference.